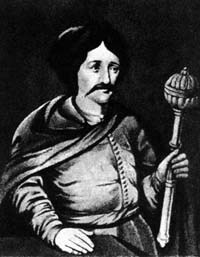 Apart from the deep-seated belief that Hetman Pavlo Teteria, one of Bohdan Khmelnytsky’s successors, ruled in 1663-1665, there is also a theory that he officially received the mace in October 1662, when Bohdan’s son Yury ceased to exercise his power as hetman. This assumption is primarily based on the text of a letter from the Cossacks to Teteria, dated November 15, 1662, in which he is in no uncertain terms called hetman. Samiylo Velychko’s chronicle also states that in mid-October 1662 “...Pavlo Teteria gathered senior officers, colonels, captains and many commoners in Chyhyryn for a council and the election of a hetman.” We also find similar information in the chronicle of Yakiv Lyzohub and that of the Orthodox noble Y. Yerlych [Joachim Jerlicz]. It should be noted, however, that neither the Cossacks’ letter (the only version of this text is cited by Velychko) nor the date provided by chroniclers may be considered sufficient proof of the fact that Teteria became hetman in the fall of 1662. (The date may be incorrect, as the Cossacks may have had faulty information). But the very existence of this data shows that Ukrainian society of those times was rife with rumors about Yury Khmelnytsky’s abdication, for it was only a question of time. An exhaustive correspondence between Teteria and the royal court, as well as the lack of letters signed by Yury Khmelnytsky, provide grounds for claiming that in the fall of 1662, when Yury was still officially the hetman, all power in fact belonged to Pavlo Teteria. “I am shouldering the whole burden of work now,” he wrote in a letter. In all probability, the period between October 1662 and January 1663, when Teteria officially assumed the post of hetman, may be termed as his “shadow hetmanship.” During this period he was apparently mapping out the political course of his future government, not wishing to reveal his cards for the time being. Crafty and ambitious, Teteria was inclined to pursue a more independent policy than the one the Polish government had prescribed for the Ukrainian hetman and which he officially declared in his letters to the king. For this reason, he may have been exploring the possibility of pursuing a policy of maintaining a balance of power among Eastern Europe’s three most influential forces: Poland, the Crimean Khanate, and Russia. He made attempts to implement this policy in the very first months of his official hetmanship. It should be noted that Pavlo Teteria was by no means a novice in the political life of Cossack Ukraine in the early 1660s. Joining the Cossack army as the war of national liberation broke out, Teteria managed to carve out quite a dashing career for himself, owing to such factors as his education and personal qualities, especially his diplomatic skills. What also played a certain role was his kinship with Hetman Bohdan Khmelnytsky, who was his godfather. Having begun his official service as regimental secretary (pysar) of Pereyaslav, Teteria immediately became the de facto deputy of the general secretary. On a visit to Chyhyryn on March 4, 1651, the Muscovite voivode L. Lopukhin called him the second secretary after Ivan Vyhovsky. It is no wonder that the hetman often entrusted him with various diplomatic and military missions. For instance, as early as September 1649 Teteria was referred to as the head of the Ukrainian delegation to Gyorgy II Rakoczi, which was dispatched to discuss relations between the Zaporozhian Sich and Transylvania. In the spring of 1651 the hetman ordered him and the military aide-de-camp (osavul) Demko Mykhailovych to command a force that was dispatched to Kamyanets-Podilsky. In the summer of 1652 the Pereyaslav secretary, who was obviously quite familiar with Moldavian affairs, was a member of the delegation that accompanied Tymish Khmelnytsky, who was on his way to Iasi (Jassy) to marry Rozanda, the daughter of the Moldavian hospodar Vasile Lupu. On July 1653 Teteria assumed the post of Pereyaslav colonel, while still continuing to act as the “deputy general secretary.” It should be noted that the office of Pereyaslav colonel was a particular post in the overall administrative structure of the Zaporozhian Sich. As Teteria himself remarked to Patriarch Makariy in the summer of 1654, the Pereyaslav colonel’s jurisdiction encompassed 9 towns and more than 500 villages. Being in charge of 40,000 soldiers, Teteria could, if necessary, mobilize a 100,000- strong army. This is why Teteria wielded considerable influence as the top executive of one of Ukraine’s largest administrative units. It is no accident that Pereyaslav was chosen as the location for the signing of the well-known agreement with Muscovy in 1654. Incidentally, at that time Bohdan Khmelnytsky again showed that he held the colonel in high esteem. On January 7, 1654, when the hetman set out for his first meeting with Muscovite envoys, he was accompanied by two people — Vyhovsky and Teteria. In February — March 1654 the colonel of Pereyaslav and General Judge S. Bohdanovych-Zarudny headed the Ukrainian delegation to conclude the negotiations on the conditions of accepting the tsar’s protection and signing the controversial March Articles. The tsarist government brought intense pressure to bear on the participants of these extremely difficult talks. The Russian side kept returning the articles, full of amendments, to the Ukrainian envoys. So the appointment of Teteria to head the delegation shows that the Ukrainian leadership highly appreciated his diplomatic skills, his ability to find a way out of complicated situations, and, what is more, his devotion to Bohdan Khmelnytsky’s ideas. The hetman continued to use Teteria as a diplomat after the latter returned from Moscow. For example, in August 1654 Teteria went to Kamianka, near the Black Woods, to meet with Tatar murzas (chieftains). It should be kept in mind that relations between Chyhyryn and Bakhchisarai became extremely strained after the Moscow- Ukraine agreement was signed; an anti- Ukrainian Polish-Crimean coalition was in the offing. So it is very significant that the mission to negotiate with the Tatars was again entrusted to Teteria. According to Vyhovsky and Teteria himself, the talks were successful enough, and the Ukrainian delegation managed to convince the Crimean envoys that the newly-established alliance of Moscow and Cossack Ukraine posed no threat to them. In August—September 1654 Teteria took part in talks between the hetman and the Muscovite envoy Ivan Rzhevsky. In October 1655 Teteria’s regiment participated in the siege of Lviv. It was he whom the hetman ordered to hold talks with the Lviv city council about surrendering of the city. There are a few interesting aspects to this episode. Firstly, Teteria spoke in Latin to the Lviv delegates, which incurred the righteous wrath of the Muscovite voivode who could not understand what was being discussed. Secondly, when presenting the Lviv negotiator Krzysztof Grodzinski with the demand to surrender and swear allegiance to the Muscovite tsar, Teteria “...secretly told a Lviv resident that they should keep their intentions intact and not give up.” At first glance, the Pereyaslav colonel was defying the hetman. Yet, the political developments of the times indicate that in the fall of 1655 Khmelnytsky began to express keen dissatisfaction with the conduct of the Muscovite voivodes, particularly, the fact that all the cities seized by the allied troops were considered the tsar’s property and had to swear allegiance to the Muscovite ruler. So the hetman himself was not interested in capturing Lviv. Therefore, Teteria’s position may be viewed as fulfillment of some of the hetman’s designs. In the summer of 1656 Teteria was one of those entrusted with carrying out Khmelnytsky’s policy toward the Belarusian lands. In particular, the hetman dispatched him and the Nizhyn colonel Hryhoriy Hulianytsky at the head of a rather large Cossack corps to Belarus. In October 1656, together with Ivan Vyhovsky, the colonel of Pereyaslav held talks with a Transylvanian delegation. In July 1657 Pavlo Teteria again led a Ukrainian delegation to Moscow in order to confirm the principles governing relations between Russia and the Zaporozhian Sich, which had been established in January—March 1654.